and which evokes our desire for the far when depicted in holiday paintings. With artworks in a Mediterranean style you will be bringing the lightness of the southern lifestyle into your living room or office. What makes this style special is that it can be realised in many different ways. Anything that reminds you of the sea, holidays, the sun and a good rest belongs to this style. What about a handmade oil painting of a lighthouse? The typical maritime motif is definitely the symbol of anything Mediterranean. Our artists even use actual sea shells sometimes to give the canvas paintings of seas and beaches a more refined and lively touch. For this reason these works also belong to the mixed media style. Within the Mediterranean style you can find influences of different cultures. Every culture is manifested in a different way and makes use of various media. Our artists too do not limit themselves to painting on canvas; instead they express their creativity in other forms too – their talent and skills are equally plain to see in handcrafted sculptures, metal wall decoration, acrylic glass prints or 3D frame art. 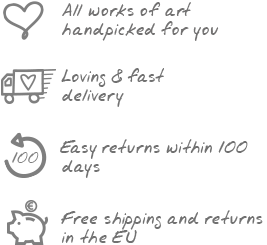 The KunstLoft collection is broad and has the perfect artwork that suits any specific taste. Let us help you decorate your office or your dining room! Warm colours and holiday motifs define the paintings and art objects of the Mediterranean style. Friendly yellow tones, lilac, blue and green set the mood in landscape and seascape paintings. Decorate your hotel with the perfect theme to make your guests feel relaxed and at home.